Home & Garden > Lawn & Garden > Outdoor Living > Outdoor Umbrellas & Sunshades"
Enjoy extra shade and privacy with A&E's Patty O'Shade. Vinyl-coated polyester mesh Patty O'Shade. 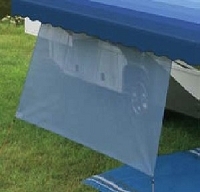 slides into the utility slots of most awning rollers. Brass grommets let you stake it to the ground with included nylon elasticized tie downs. Requires no tools or assembly. Fire retardant and weather resistant. Coordinattes with all A&E patio accessories. USA.